Craft the perfect sales manager resume using our downloadable sample and expert writing tips below. In a rush? Just use our fast and easy resume builder! • Candidate has over 10 years of experience in the sales industry. • Candidate emphasizes managerial and training expertise in the resume content. • Candidate focuses on professional achievements rather than normal job duties. Sales Management with over 10 years of experience training and supervising sales staff while planning and implementing sales strategies over a multi-state territory. Seeking to bring my proven record in team leading and in launching successful marketing campaigns into a senior management position. Obtained a Masters in Business Administration in June, 2008. 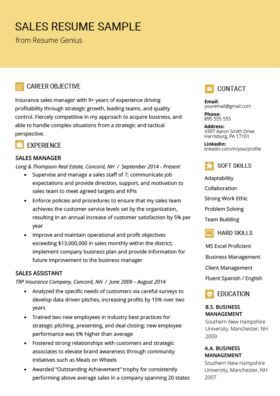 Referencing this sales management resume sample can help you write your own highly effective resume. This sample and guide are written in a reverse chronological style. The Bureau of Labor Statistics found that in 2012, there were 358,300 U.S sales manager positions. The number is expected to grow by 8% in ten years. Most sales associates with a bachelor’s degree are able to move up to a managerial position in less than five years. As a director of sales teams, ideal candidates have outstanding analytical, communication, and leadership skills in addition to successful sales experience. 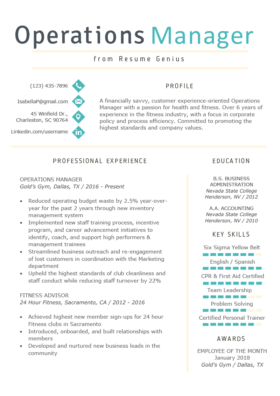 Our sample resume is an excellent example of how you can package your years of sales experience for that managerial role. Below we’ve listed some guidelines and major considerations to help you craft that winning sales director resume. Sales Management with over 10 years of experience training and supervising sales staff while planning and implementing sales strategies over a multi-state territory. Here, in the first line, the applicant provides a summary of his main job capabilities, including the number of years spent in a given industry and highlighting major achievements. Seeking to bring my proven record in launching successful marketing campaigns and team leading in a senior management position. Lastly, the candidate wraps up the career objective with relevant and up-to-date degrees, licenses, certificates, or coursework that may be of interest to hiring managers. Obtained a Masters in Business Administration in June 2008. The career objective functions as a preview and a summary of the body of the resume. Read more about writing a strong career objective here. Be very strategic about what you put on the body of your resume. When you write out your past work experiences, a tight description is much better than a long, exhaustive list. For one, a thoughtful list reflects thought and mastery over your job. It also lets you highlight to the reader your most impressive skill sets and capabilities. Our applicant used very descriptive language to detail his job experiences, using industry-specific buzzwords such as “sales operations,” “marketing campaigns,” and “retail channels.” But more importantly, the applicant placed great emphasis on words such as “strategize,” “implement,” and “supervise” that denote action and execution. These verbs most vividly communicate job capabilities, like leadership and initiative, that recruiters would look for in a candidate for a managerial role. Writing in achievement-oriented language makes your resume much stronger. Why is it important to quantify your experiences? In short, presenting hard numbers give hiring managers a real reference point for your achievements and also demonstrate that you have been able to achieve concrete results. Implement strategic goals for marketing campaigns with billings in the range of $1M to $3M; serve as project manager, leading a team of 20 creative and technical staff. These numbers provide a reference for the scope of the candidate’s scope past marketing campaigns (“billings in the range of $1M to $3M”), with the added context of the applicant’s leadership reach (“20 creative and technical staff”). If you don’t have much work experience, don’t worry — you can also quantify parts of your educational history section to stand out from other entry-level applicants. Consider this a space for you to list out other soft or technical skills that you haven’t stressed elsewhere on your resume. Consider what skills, assets, or even personal traits would make you a better candidate for the position. In this case, our candidate emphasizes that he has “established networks and contacts in mass market distribution channels” that can certainly serve as an advantage for launching major marketing campaigns. Graduate coursework in technical topics also supports our candidate’s demonstrated qualifications in market analysis and strategy. By following the tips above, you’ll surely avoid having your resume thrown in the trash like many other applicants. 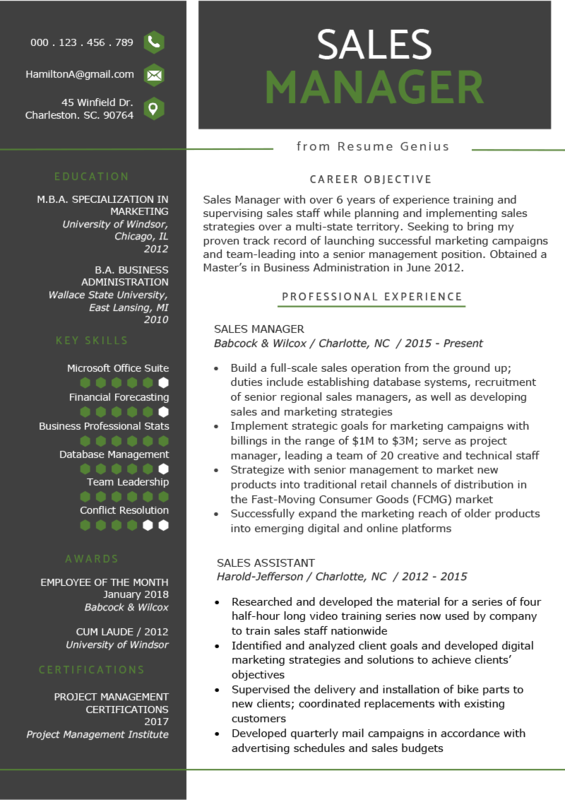 If you have more questions about how to write a sales resume, leave a comment below.